Since early April Bob and I have been in Sarasota County, exploring job and investment opportunities and looking for a place to live. It hasn’t been total drudgery by any means. We are the kind of people who follow Mary Poppins’ advice and have “a spoonful of honey to make the medicine go down”. 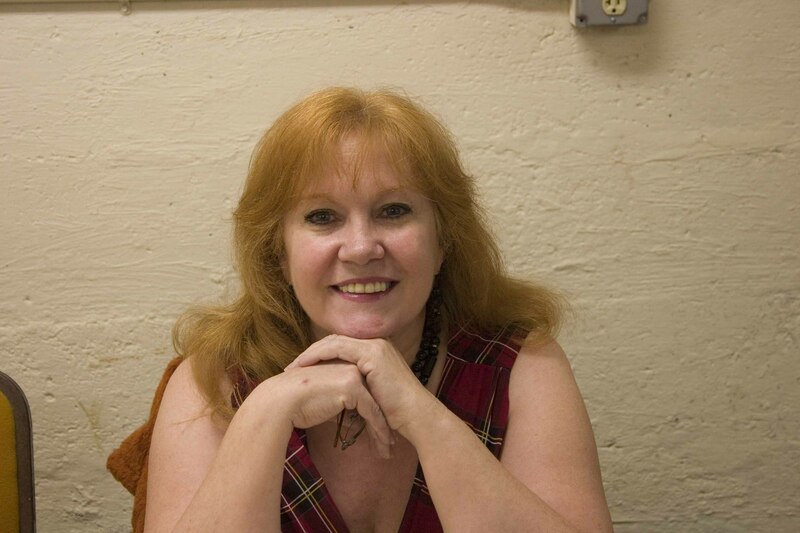 In this case the spoonful has consisted of mornings and evenings at the beach, walks through parks, attending the Unitarian Universalist Church and getting to know people there, and in general visiting various areas of Sarasota. We’ve probably eaten out more than is good for our physiques and our cholesterol numbers but we have offset this with daily laps in the pool, walks along the shore, and swimming in the ocean. A couple of weeks ago Bob flew up to New Jersey to bring our youngest son down from college. He had previously visited Sarasota with us when we first made the trip to decide if we wanted to live in Florida and if so, where. Given that he is still young enough to be living with us for some time, and that he had expressed an interest in starting a business with us – it was important for him to have a say in the choice. Trevor loves looking for prehistoric sharks teeth on Venice beach, the skate parks, and just relaxing after a grueling semester. He and Bob are planning a marketing plan for their new business while I continue to make contacts in the healthcare arena. Last week we put everything on hold to vacation here with our middle son who is a nuclear engineer in the Navy and will soon be deployed to Guam for 6 years. 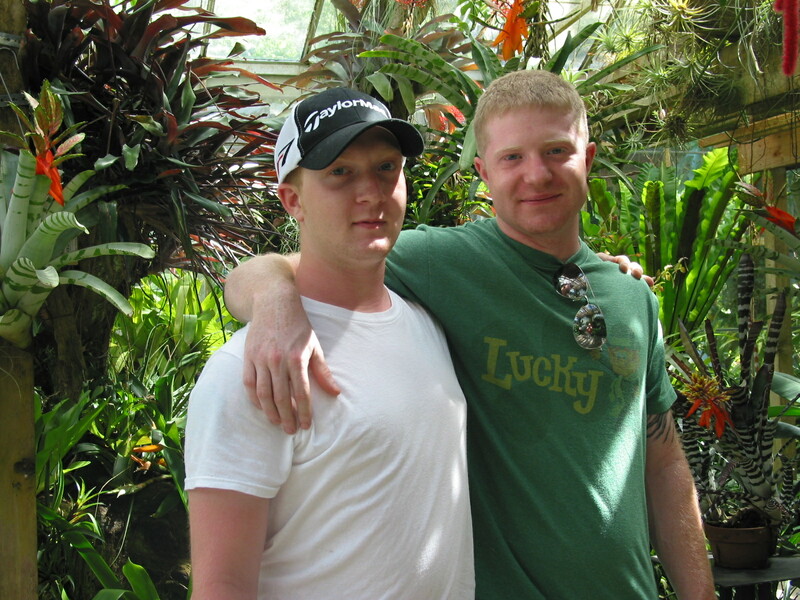 Every day we had plans – sometimes visiting areas we have already explored but wanted to share with two of our sons. Brian has been so used to working long days and having the constant challenge of the naval education that he chomps at the bit if we aren’t doing things all the time. We tried hard to pack our days with activities he would enjoy. Oh what a week we had! First of all we finally visited the John and Mable Ringling Museum Estate on 66 acres of Sarasota bayfront property which is actually home to four attractions and several gardens. We didn’t visit the Asolo Theater as there was a performance of the play about Ginger Rogers, “Dancing Backwards in High Heels”. I thought it would be entertaining however my sons vetoed the idea of watch a play about a celebrity from the 1930’s. Despite the fact we didn’t spend any time there, I am quite interested in this theater. The theater was created in Italy in 1798 to honor an exiled queen. 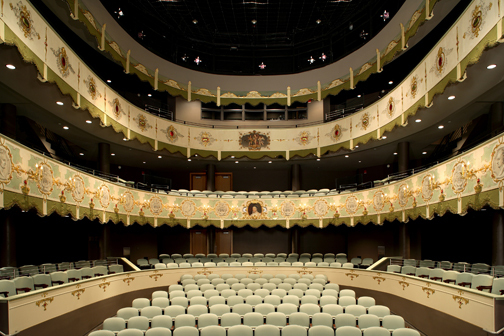 In the early 1950’s the decorative panels were sold to the Ringling Museum and in 2006 America’s only 18th century European theater was reset on the Ringling Museum Estate. Today one can enter a work of art to attend the diverse roster of performances including theater, music, film, dance, and lectures. 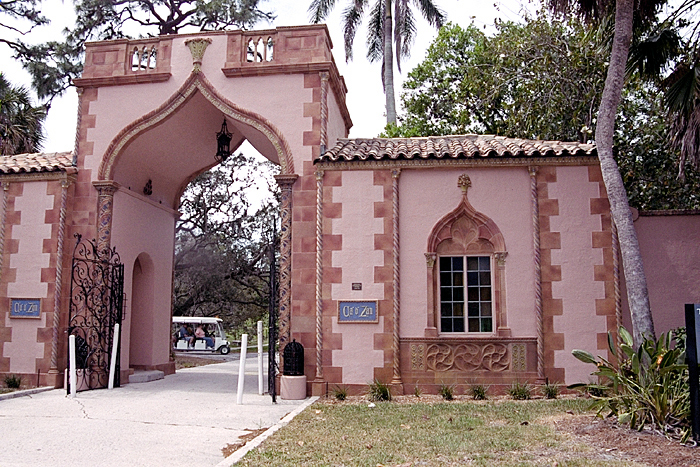 Sarasota has a number of musical venues but this one by far has the most interesting past. 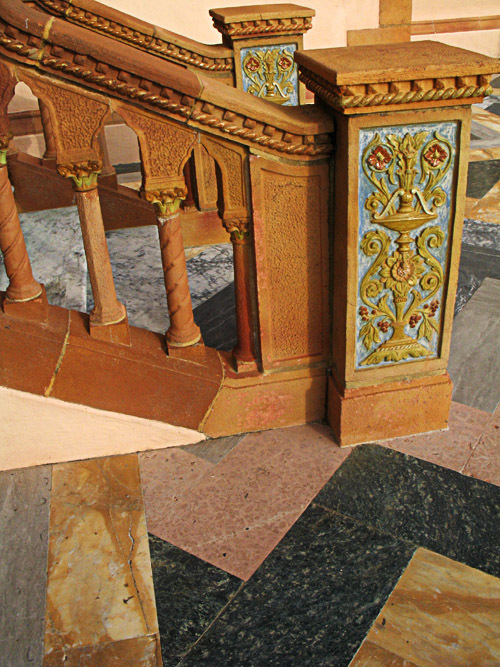 As one enters the Ca d’Zan (House of John) Gatehouse one is immediately struck not only by the ornate beauty of the carvings but also the sweet fragrance of a least a dozen gardenia plants. What a promise of things to come! We first meandered through the gardens and heat to the Circus Museum which is housed in two buildings. In the Tibbals Learning Center there is a remarkable, 50 year endeavor by the master model builder Howard Tibbals. 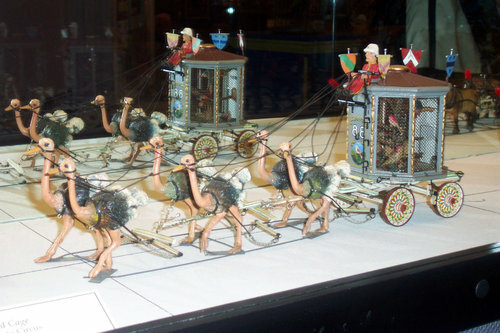 The circus model is a replica of the Ringling Brothers and Barnum & Bailey Circus from 1919-1938. The ¾” to a foot scale occupies 3,800 square feet and is the world’s largest miniature circus. The attention to detail and the craftsmanship is amazing. Each face and body of the 1,300 circus performers and workers are individual, as are the over 150 circus wagons, and the animals. Imagine the creativity and research that went into such a project! From there we walked next door to the Museum of American Circus which was established in 1948. 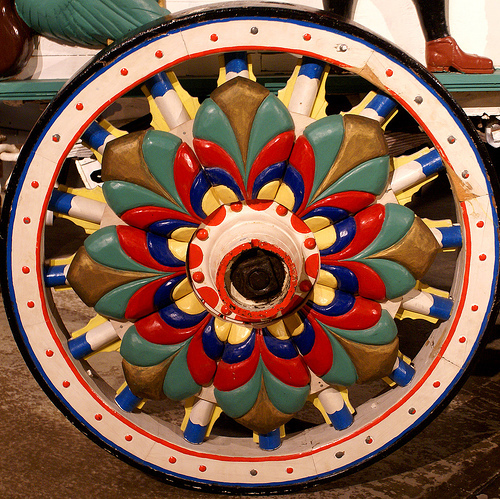 The museum chronicles the circus and has a rich history captured in the memorabilia. One of my favorite items was a restoration of the elaborate train car that John and Mable used to travel through the country in general and especially from their mansion “up north” to their winter estate in Sarasota. 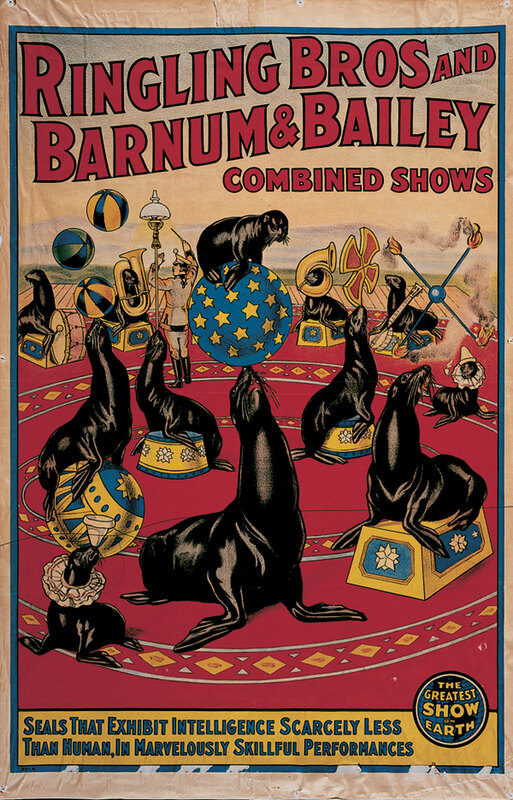 In this museum one can wander around looking at the posters bragging of the world’s largest and smallest people, see the costumes used by the trapeze artists, clowns, and trick horseback riders, and view the original circus carts. What a spectacle it must have been when the circus came to town! Honestly I haven’t enjoyed the circus for some time. There is something rather sad about the wild animals housed in such small areas and forced to entertain each night. But I am as dazzled as the next person by the incredible performances by members of the circus families. We slowlycontinued on the path, enjoying the diversity of plants along the way, grateful for the canopy of trees that shielded us from the Florida summer sun, we stopped first to have cold beverages at the Banyan Café and to enjoy the mammoth tree for which it was named. Then we strolled past the Secret Garden to the Ca d’Zan Mansion. 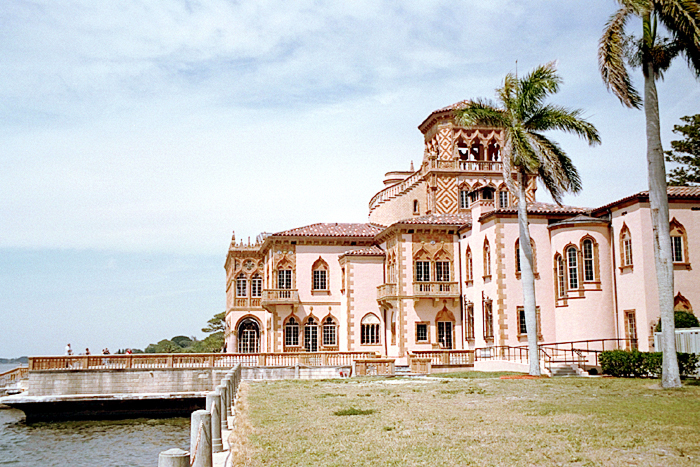 This 56 room Venetian-Gothic mansion was influenced by the Ringling’s travels through Europe. Mable was enamored with Italy and even had a Venetian gondola docked along the exquisite marble floored bayfront terrace. Mable took the lead on working with an architect to design a tribute to the palaces and hotels she visited on the Venetian canals. For her daily meetings with the architect she carried an oilskin portfolio filled with postcards, pictures, drawings, and notes collected over her many visits to Italy. The ostentatious mansion was completed in 1926 and of course it became the center of cultural life in the area with lavish parties being the norm. I could picture the orchestra playing and people dancing both in the ballroom as well as on the terrace. 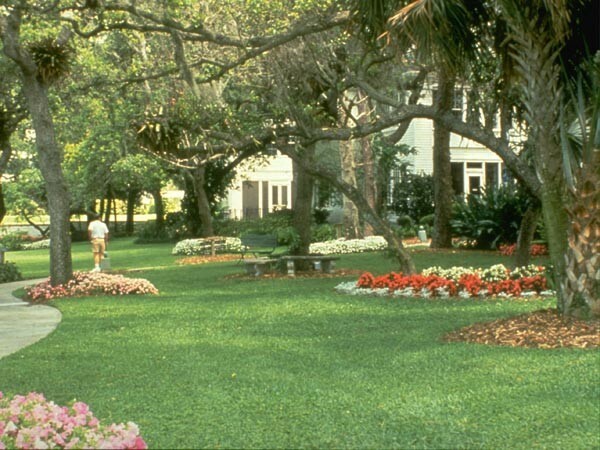 We continued on through Mable’s Rose Garden, literally stopping to smell the roses, to the 21 gallery Ringling Museum of Art which houses a remarkable display of European art. As the Ringlings traveled through Europe they collected Rubens, van Dyck, Velazquez and more. 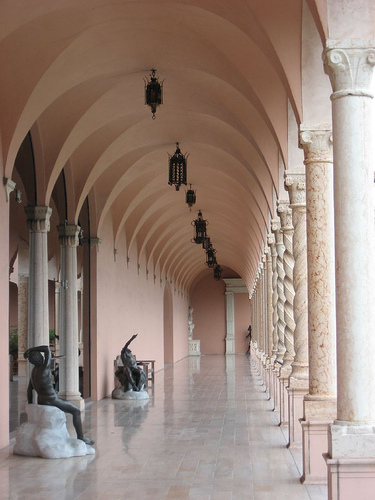 Later John Ringling acquired a collection of Greek, Roman and Cypriot artifacts from the Metropolitan Museum of Art in New York City. In 1925 while Mable was busy working on the Ca d’Zan mansion, John started building a palace to house his treasures. The death of Mable in 1929 and financial misfortunes due to the Great Depression took its toll on John. Construction on the museum was halted for a period of time . Eventually he borrowed money and finally finished the museum in 1931 in memory of Mable. The outside garden courtyard is as remarkable as the interior of the museum, featuring the “Towering David” by Michelangelo as well as a number of other impressive sculptures and fountains. All in all we had a wonderful afternoon walking through gardens, visiting circus and European history, sitting on a terrace looking out at Sarasota’s magnificent bay, and sharing memories. It was well worth the wait and if you are in the area, I highly suggest you make this part of your itinerary. This entry was posted in Bob Wilson Photos, Florida, Retirement/Reinvention and tagged Asolo Theater, Banyan Cafe, beach vacation, best vacation, Ca d'Zan, Circus Museum, family trip, family vacations, Mable Rose Garden, Ringling Brothers and Barnum & Bailey Circus, Ringling Museum of Art, Sarasota, Shawn Phillips, Tibbals Learning Center, vacation spots. Bookmark the permalink. Such a juicy post! You are blessed that Brian is headed to Guam vs. Afghanistan or elsewhere. A nice tropical post (tho I assume he will be working hard). You must be proud of him. Good luck on the job-hunting. I know you’ll keep us posted. LOVE your blog, Shawn.